You probably know that tapping once on the screen within the Camera app will cause the iPhone to automatically focus and adjust exposure to that region in the viewfinder, but if you’re trying to take a picture with challenging lighting or depth conditions the auto adjustments are not always ideal. Note you must tap-and-hold until the AE/EF Lock text appears, otherwise the exposure and focus lock won’t be set and it will adjust as you pan around. You can then take a picture right away, but once the lock is set you are free to move the camera around and the lighting and depth settings will stay the same. Tap elsewhere on the screen again at any time to release the AE/EF lock. The end result of how pictures turn out can be dramatic, especially in situations where lighting matters. In the example picture up top, the left side shot is how the iPhone wanted to automatically set the lighting, and the right side shows the result of locking onto the lightbulb. Auto-focus and auto-exposure can be stacked with zoom on the iPhone too, and it works on the iPad and iPod touch as well. This is one of those great ticks that can make average iPhone photos look like they were taken by a pros, and unless the iPhone camera gets some manual controls for exposure and aperture this is the way to go. Wow, never knew that before.. Thanks!! Thanks for the info – very useful indeed. Others may like to know that the same AE/AF lock system works in video mode too. The iPhone Camera is good as far as it goes but with the Camera+ app you get the ability to focus on one spot and set the exposure using another. 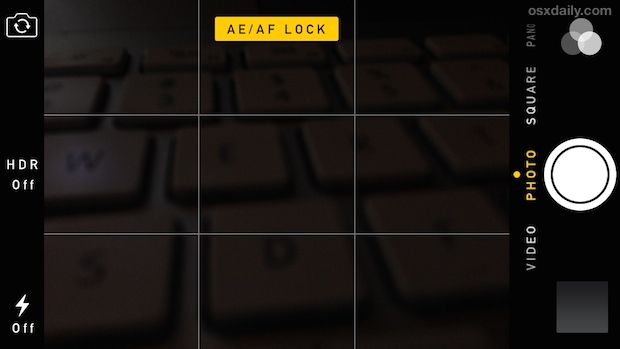 Plus you can separately lock the focus, exposure, and white balance. Camera+ also has some really nice post processing adjustments such as filters, frames, etc. Camera+ is what I wish the iPhone Camera was. When I put a macro or wide angle lens on my iPhone 6+, the screen jitters and shakes. What am I doing wrong? Ho do you get your phone of of the lock?